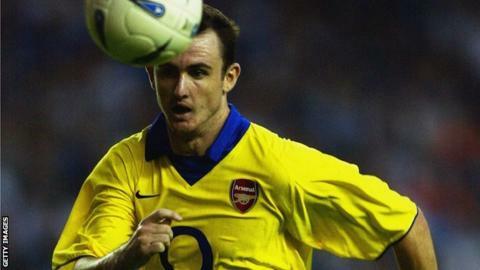 Former Arsenal and Everton striker Francis Jeffers is in talks with Maltese Premier League club Floriana. Jeffers, 31, was at Australian club Newcastle Jets last season but has opened discussions with Floriana, who also hope to sign former Fulham keeper Tony Warner, 38. In 2012 Floriana signed a partnership agreement with British investor Stephen Vaughan. Lost 12-0 on aggregate to Sweden's Elfsborg in the Europa League qualifying round, with the second leg in Malta attracting a crowd of just 266. "We hope to finalise all contract terms before the eagerly anticipated derby against Valletta on 20 October," said a statement on Floriana's website. Floriana are seventh in the table. Jeffers started his career at Everton before completing a £10m move to Arsenal in 2001. His career has also taken him to Charlton, Blackburn, Sheffield Wednesday, Newcastle Jets and Motherwell. In addition, Jeffers has had loan spells back at Everton, Rangers and Ipswich. He made one appearance for England, scoring as a substitute in a 3-1 defeat to Australia at Upton Park in 2003.